In my time of makeup use, I’ve always found Maybelline to be a reliable drugstore brand for eyeshadow. This product has proved once again that it is possible to find an eye shadow with strong pigmentation, for a lower price. 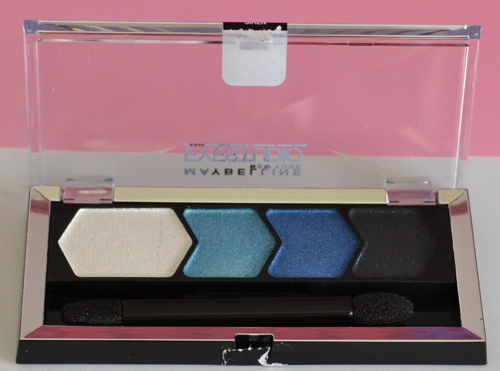 The Eye Studio Eye Shadow Quad comes in a range of different colour palettes, which can be found here (scroll down). Comes with a sponge applicator, one double sided end with thicker width and one double sided end with liner width. Two blue tones, white and black. All colours are shimmer, there are no matte shades. The applicator sponge allows for good pigmentation. Each colour compliments one another. 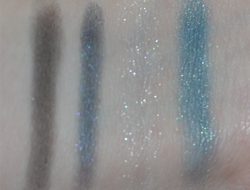 The layout of the four shadows makes it easy to create a certain look (which is also pictured on the back of the packaging). I would recommend using your own brush when applying this shadow to the crease, as it’s easy to misjudge the shape with the provided applicator. A small angled brush would also be best for applying eyeshadow beneath the waterline, as the sponge comes out with quite a thick line. 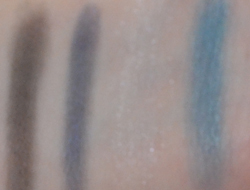 Keep an eye on my blog, as I’ll soon be doing a tutorial on how to use this palette to get a nice blue eyeshadow look. Hola guapa, gracias por pasa por mi blog :) para mí es un placer. Quiero felicitarte por el trabajo que haces en tu blog, enhorabuena! Te espero en mi blog. These are really pretty colors! Definitely a great night out look.